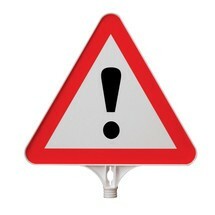 With the "Attention” information sign, triangle, for traffic cones and barrier posts, road users are warned of possible danger areas in order to prevent accidents. It is made of robust and weather-resistant polypropylene. 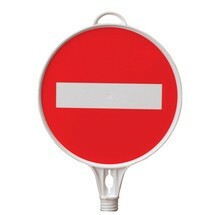 You can use the information sign "Access prohibited”, round, for traffic cones and barrier posts, to identify routes and roads that must not be taken. It is made of robust and weather-resistant polypropylene.